Want to send anonymous emails, but don’t really know how or why? Luckily, we’re here to help! Every day we use email to communicate with our colleagues, friends, and family. Usually, we never give privacy a second thought when writing out a quick email. But, there are times when sending an email anonymously is an absolute necessity. If the information got out it would be compromising, embarrassing, or even dangerous. 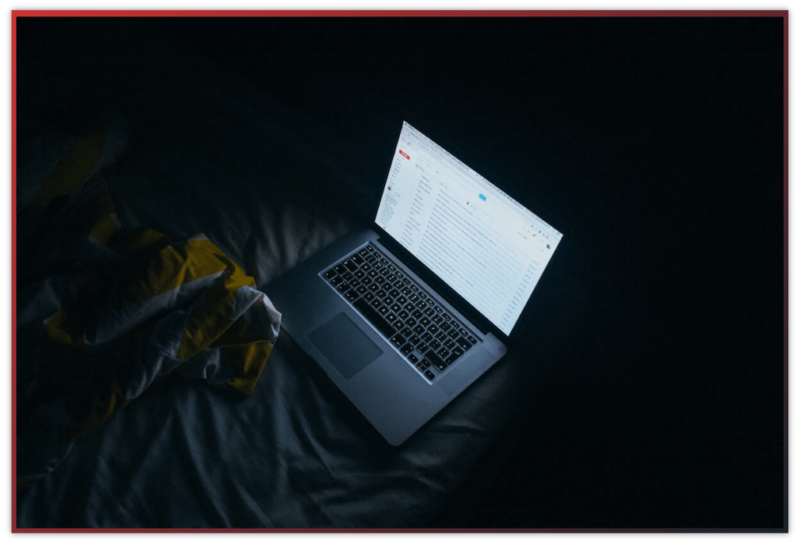 Chances are, you don’t need to send 100% of your emails anonymously, but when the need arises you’ll want to know how to do it. Below you’ll learn what anonymous email is and how it works, so you can start sending your own anonymous emails. Can You Use Outlook for Anonymous Email? In our digital world, almost every facet of our lives is out in the open. Unless you take the extra steps to protect and defend your privacy. Email is something we use every single day. We spend hours in our inboxes and often share personal information we want to keep private. Anonymous email gives you the ability to send an email that can’t trace back to you. It won’t contain any personal identifying information. Sending emails through a proxy server, so your location is invisible. Still, anonymous email accounts can be used for less than upstanding purposes. Like a hacker using an anonymous email address to send a malicious email containing a virus. These emails will contain a link that’ll install a virus or malware on the user’s computer to gain sensitive information. I know you won’t do this, but there can be some negative associations built into anonymous emailing. There are many ways to send emails at varying degrees of anonymity. The basic method involves entering a fake name and personal information when creating a Hotmail, Outlook, or Gmail account. This approach won’t get you complete privacy, and you’ll need a personal phone number to verify your account. But, it’ll grant you more privacy than your standard account. The truly anonymous approach involves using a private email service. These tools and services need minimal personal information to get started. We’ll get more into these services and tools, and how to use them, below. You’re probably wondering, what’s the difference between anonymous email and regular email? They both accomplish the same core goal of sending an email. But, they differ in the level of privacy and protection each provides. Anonymous email affords you levels of security and privacy you can’t get anywhere else. You might not need it 24/7, but it does have certain benefits. Sometimes you need to convey information to a person, but don’t want to compromise your identity. It could be something that’ll ruin the relationship, or you’d like to remain anonymous nonetheless. If you have sensitive information you want to send to the authorities without revealing your true identity, then you can use anonymous email for this purpose. You can easily send confidential information without fear of your identity being brought to light. Whistleblowing can be a scary and stressful situation. With anonymous email, you can help to escape any harassment and persecution that might come with. Think of it as giving an anonymous phone tip from a pay phone. Using anonymous email can be a way to whistleblow about any wrongdoing while protecting your identity. You could use a throwaway email account whenever you enter your email anywhere online. This can help to isolate your identity and any spam emails from your main inbox. But, you’ll still have a link back to your true identity. With an anonymous email account, you can create aliases and segment your account to keep your information safe from spammers. Why Use a Regular Email Account? Even with the security and privacy anonymous email affords, a regular email account can be useful. It can be tough to build a relationship with anyone over email if you’re completely anonymous. Think of it like contributing to an online forum. You may be able to help and make connections with people. But, it’ll be difficult to build a deep connection without actually knowing who you’re talking to. For those who aren’t very tech-savvy signing up and using a service like Gmail couldn’t be easier. This service, and others like it, are created to deliver the best user experience possible. They’re engineered so you need zero tech knowledge to get started. Services like Gmail give you login privileges to other sites. Privacy buffs may scoff at this, but for some users, speedy login is a necessity. Instead of creating multiple accounts, you can login to various sites and apps with your Google account. Some people shy away from using anonymous email, because of the associated costs. After all, services like Gmail and Hotmail are free. But, these services do run ads in your email account to make up for the “free” service. Would you rather pay for your email service with cash, or with your personal information that’s sold to third-party advertisers? You’ll find a variety of paid and free anonymous email options. There are pricier anonymous email services. But, you’ll also find a ton of free and cheap options. Anonymous email, with all the protection features they provide, aren’t that pricey. Especially if you’re purchasing an account for yourself, and not for your entire organization. Individual costs for an anonymous email account range from $25—$80+ for the entire year, with an average monthly cost of $5 per month. And that’s just for the premium accounts, which are equipped with extra storage, and security features. Almost every anonymous email provider also offers free accounts. These accounts are limited by the amount of email storage provided or the number of emails you can send per month. Creating an anonymous email account is similar to creating any other form of email account. 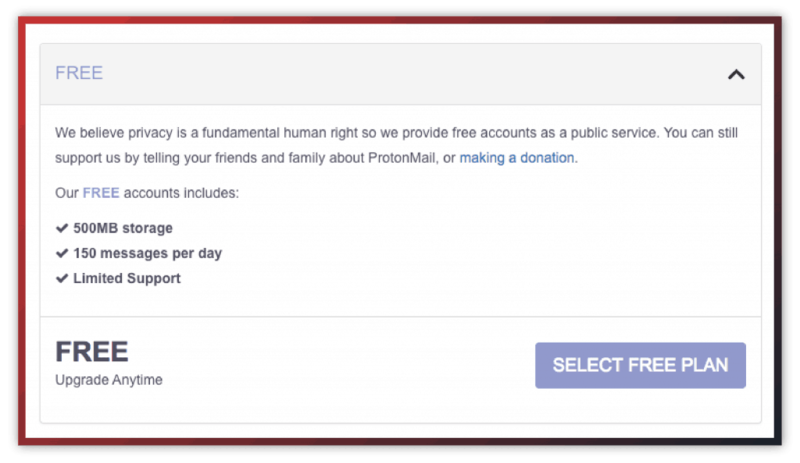 For the tutorial below we’ll setup a free account with ProtonMail. The only limitation to the free account is the amount of storage provided. You’ll still have access to all the privacy features. On this screen choose the ‘Select Free Plan’ option, unless you want to upgrade to a paid account. Here you’ll create your anonymous email address and password. You have the option to add a recovery email, in case you ever forget your password. But, this could create a link to an existing email account, so those looking for complete anonymity might want to leave this blank. Now it’s time to prove you’re not a robot. Choose one of the four options to show that you’re a living breathing human being. Then, click ‘Complete Setup’ and your account will be automatically created. You’re now ready to send completely anonymous emails. On this screen, you’ll see what looks like any traditional inbox. Here you can send and receive emails, as you would any other type of email account. You’ll also be able to upgrade your account to further support the service an unlock additional features. Sending an anonymous email couldn’t be easier. For this example, we’re going to use the same service from the example above ProtonMail. First, navigate to the backend of your account, and click on the ‘Compose’ button. Here a window will pop up and you’ll be able to compose an email, just as you would in Gmail. You’ll also have additional options to further secure your email. In the left-hand corner of the window, you can password-protect your email, and set an expiration date. To set a password for the email click the box that looks like a lock. Then, type in your secure password. Note that the recipient must have access to this password in order to view your email. To set an expiration date for the email click on the box that looks like an hourglass. 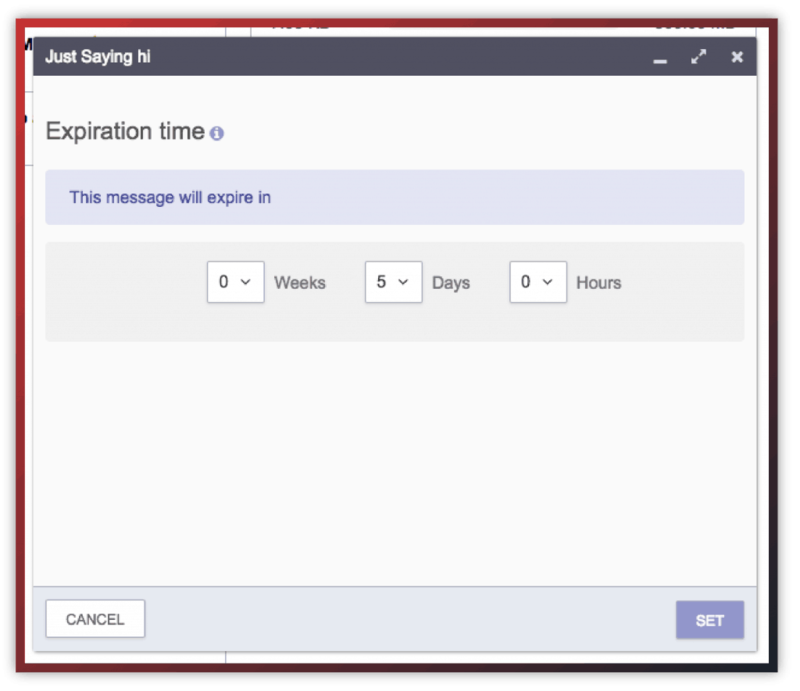 Here you’ll be able to set a time window where the recipient can view the message before it’s deleted. Once you’ve configured your privacy settings, then click the ‘Send’ button and your email will be delivered. There are many different anonymous email providers. 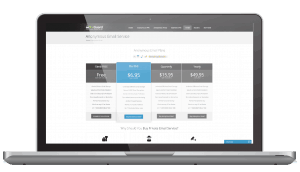 But, you’ll find that most have a simple setup process and mirror the features of your traditional email provider. Maybe you just want to send an anonymous email without a needing a response. There are multiple tools that’ll let you send one-way anonymous email without having to register an account. The simplest method is using an online tool called Anonymous Email. To do this, navigate to the site. Fill out the form on the homepage as if you were sending a normal email, then scroll down and click ‘Send’. 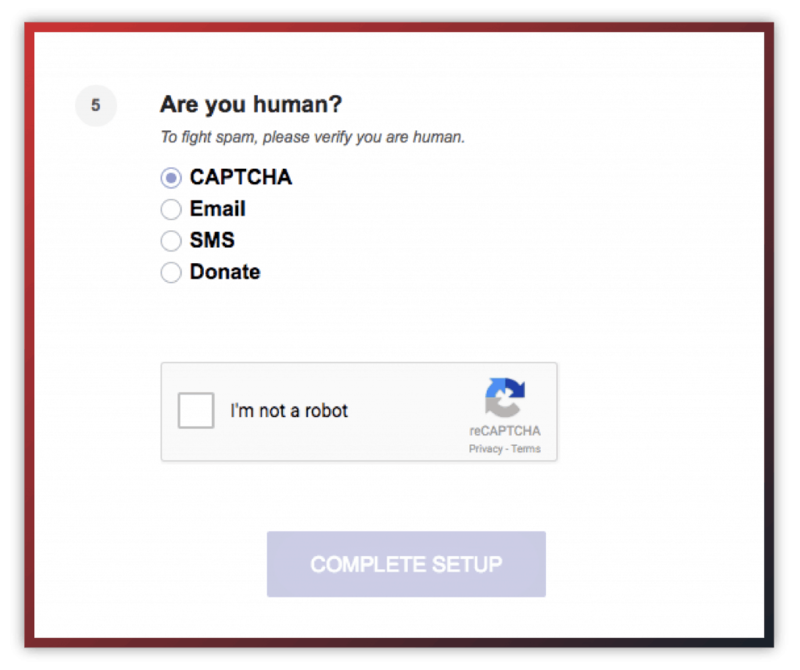 You’ll also have the ability to forward and track any responses to an existing email address, like Gmail. Beyond ProtonMail and the other anonymous email providers above, there are many other tools and services you can use to send emails anonymously. Guerrilla Mail is an encrypted email service that’s been operating for over a decade. Plus, you don’t have to sign up to send emails with the service. Just create your own email address, or use the scramble address feature for an entirely random email address. 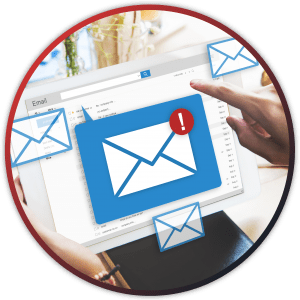 MailFence offers you a complete email suite, along with features like encrypted email, no tracking or spam, and freedom from surveillance. Plus, with its location in Belgium, it has very strong privacy protection laws surrounding the company. 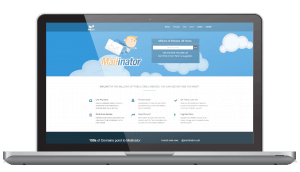 Mailinator lets you create and give out unlimited email addresses, and check messages for those addresses on their site. This helps to keep your identity private and effectively shield you from any risk. The email address itself is public, but you’re not connected to the email address in any way. 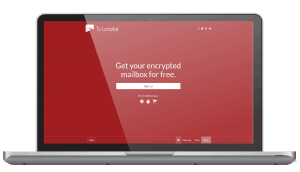 Tutanota is a secure email provider that offers end-to-end email encryption. Plus, it’s open source so it’s entirely free. Since IP addresses aren’t recorded, and you don’t need to provide any personal information to setup an account, you can use the service completely anonymously. The Anonymous Email is a pretty basic tool that lets you send anonymous emails. The only information required to create an account is an existing email account. If you’re concerned about sharing your personal email, then you can create a burner email account to register for the service. Secure Email is a fully anonymous email service. 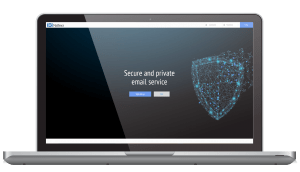 It routes all email traffic through an encrypted SSL connection, hides your IP address, and requires zero personal information to sign up. With the high-level of encryption offered no one will be able to read your emails, except you. TorGuard has a built-in anonymous email service. If you’re already a member of their VPN service, then the service is free. 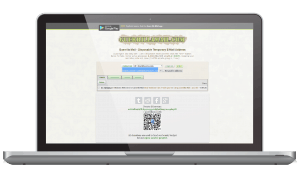 This service has a lot of advanced privacy and encryption features to protect your emails. Plus, no personal information is required to create an account, so you can send emails totally anonymously. If you’re concerned about your privacy and want to use an anonymous email provider 100% of the time, then you can transfer your existing traditional email account to a secure provider. 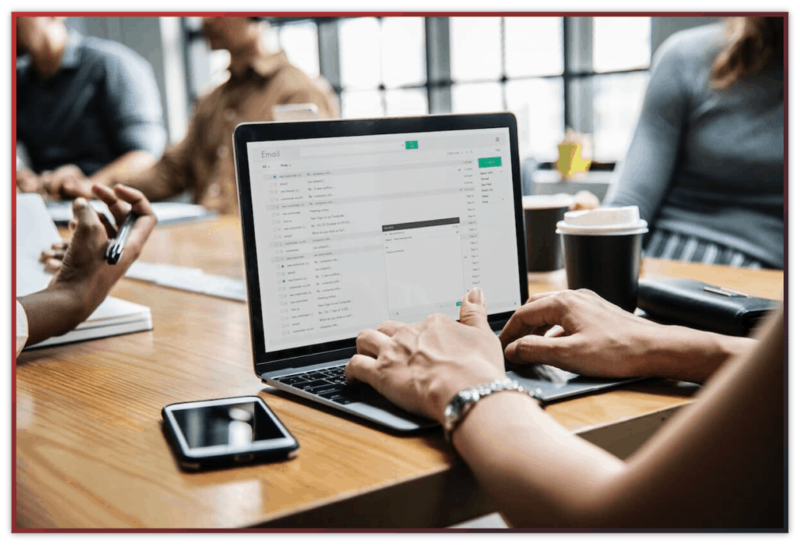 Below you’ll find a few walkthroughs that’ll help you transition from Gmail to three of the most widely used secure email providers. The first transition step is emailing your most common contacts and letting them know about your email address change. The best way to do this is send an email from your Gmail account with your new ProtonMail address CC’d. The first thing we need to do is export our contacts from Gmail. Open up your Gmail account. On the top left-hand corner click the Gmail logo and then select ‘Contacts’. Then, on the Google Contacts page select the ‘More’ option from the left-hand menu. Finally, select ‘Export’ and choose the ‘Google CSV’ format. Now, open up your ProtonMail account, and select ‘Contacts’ from the top menu. 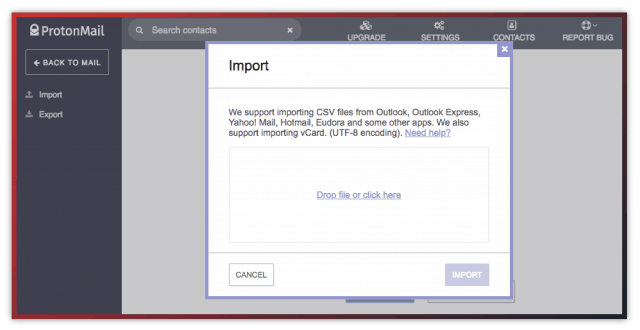 Select the ‘Import’ option and upload the .csv file you just downloaded. Your contact list has now been migrated to ProtonMail. 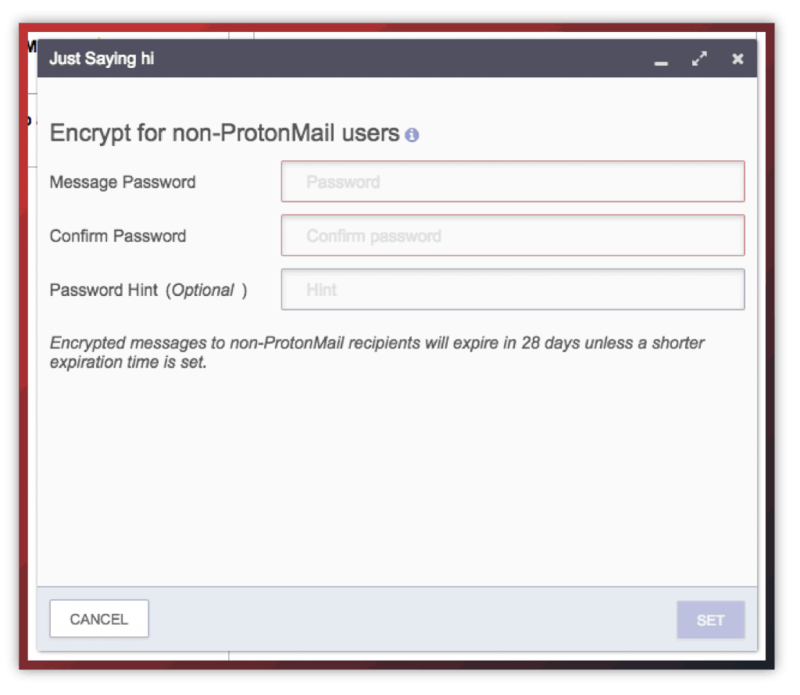 The only way to import your existing messages to ProtonMail is to use a paid add-on called ProtonMail Bridge. If you don’t want to upgrade to a paid account, then your best course of action is forwarding your Gmail messages to ProtonMail. Login to your Gmail account and click on the gear icon, then select ‘Settings’. 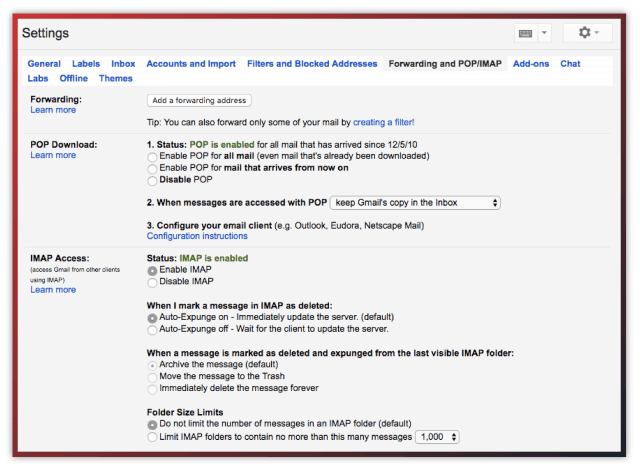 Then select ‘Forwarding and POP/IMAP’. 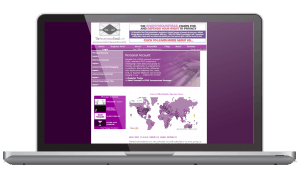 Select ‘Add a forwarding address’, and enter your new ProtonMail email address. 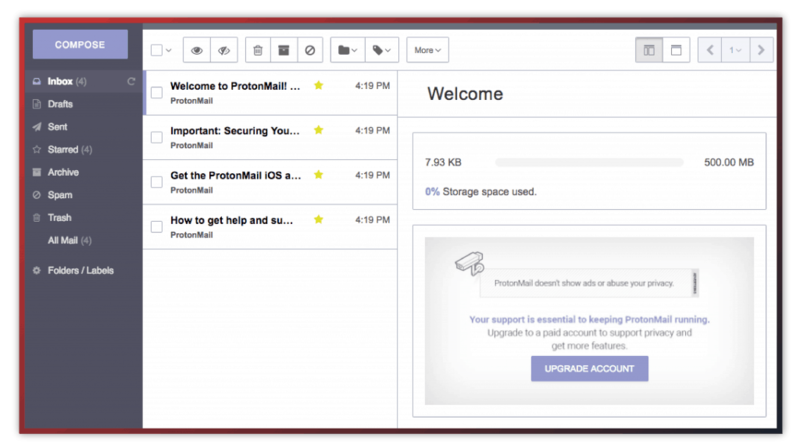 Then you’ll receive a confirmation email in your ProtonMail account. Verify your email address and you’re all set. If you’re a MailFence user then follow the steps below to add your Gmail contacts to MailFence and forward any new messages to your MailFence account. Like the ProtonMail transition tutorial above it’s a good idea to send out emails to any contacts you regularly email about your contact change. That way they can add your email to their contacts and it won’t be marked as spam. If you decided to use MailFence, then migrating your contacts over to Gmail is a very straightforward process. First, you’ll need a MailFence account, so if you don’t have one do that now. Once you’ve activated your account, click on the ‘Contacts’ button on the top navigation bar. Then, click the three dots, and select Import. 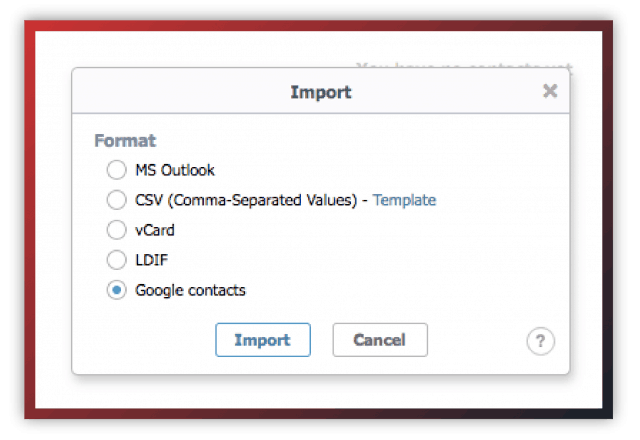 Select ‘Google contacts’ and click ‘Import’. On the next screen you’ll be asked to enter your Google credentials, and once it’s verified your Gmail contacts will be imported into MailFence. To setup email forwarding between Gmail and MailFence, you’ll follow the exact same steps as the Gmail Forwarding section above. So, scroll up a tiny bit and follow those same instructions. 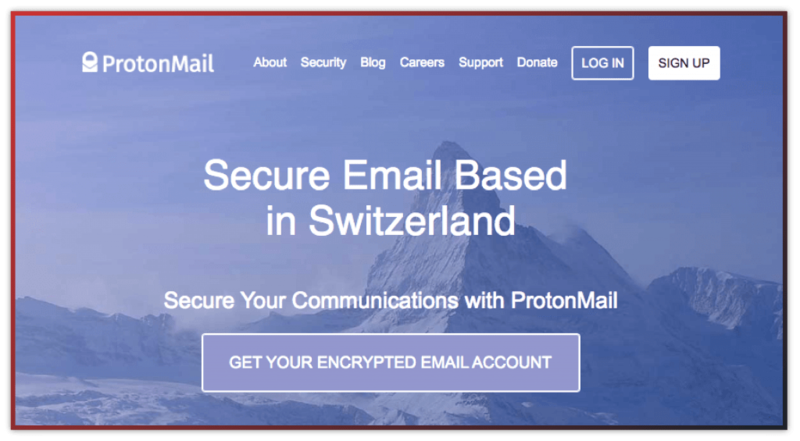 Just enter your MailFence email address instead of the ProtonMail address. 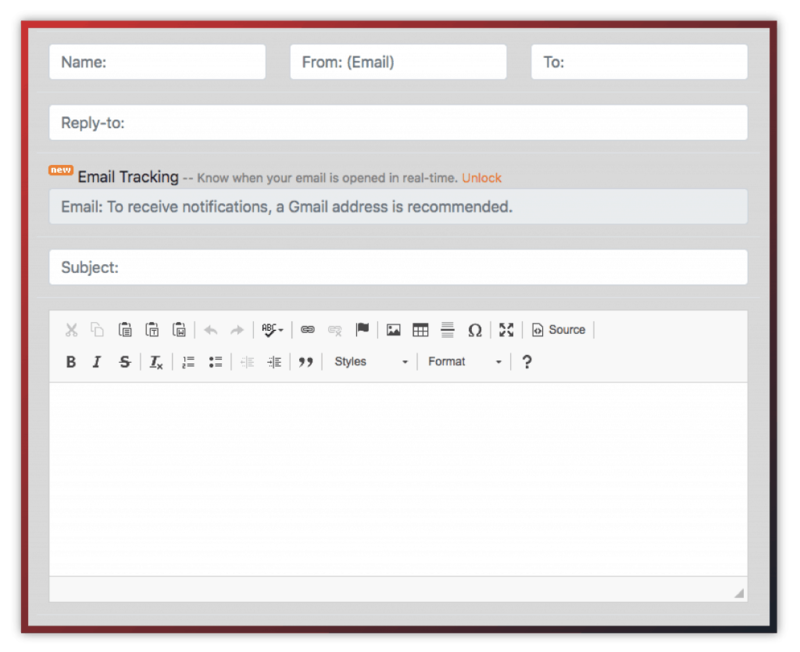 Since Mailinator is such a simple tool it isn’t something you’ll want to use as a replacement for Gmail. 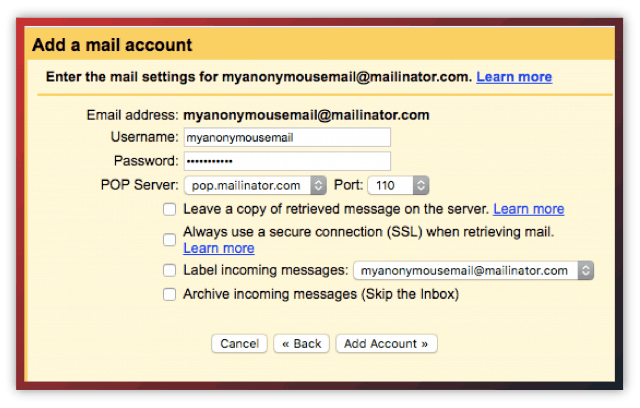 That being said, you can still manage your anonymous emails sent from Mailinator within your Gmail inbox. 1. Login to your current Gmail account and select the gear icon in the upper right-hand corner, and select ‘Settings’. 2. Find the ‘Check email from other accounts:’ section and click on ‘Add an email account’. 3. Enter your email and click the ‘Next’ button. 4. Select the ‘Import emails from my other account (POP3)’ option and click ‘Next’. 5. 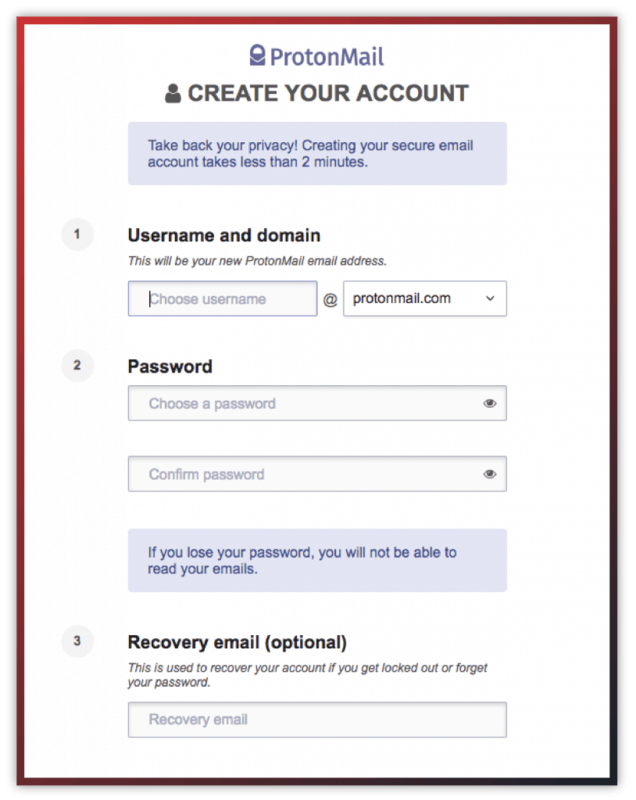 Then enter your full email address in the ‘Username’ field, enter your account password into the ‘Password’ field, and leave the dropbox box as ‘pop.mailinator.com’ in the ‘POP Server’ field. 6. Click ‘Add Account’ and you’re all set. Your anonymous Mailinator emails will now show up in your existing Gmail account. A lot of people think that you can use aliases to hide your true identity when using Outlook. Aliases can be used for purposes like creating a more secure password recovery address or creating a junk email account for those times when you’re forced to register for an online service. But, these aliases don’t allow you to remain truly anonymous like the tools and services highlighted above. It’s simply a pathway to create a throw-away email address. Now, if you want to use Outlook with the greatest level of anonymity possible, then you’ll want to use the Tor browser, and send emails from an Outlook alias. That way your location won’t be known. But, your alias can still be traced back to you as a person. If you truly want to send anonymous emails, then use some of the tools and services highlighted above. There are a variety of different tools and services you can use to send anonymous emails. Some have powerful encryption protocols to secure your messages, while others do a great job of allowing you to send one-off anonymous messages. 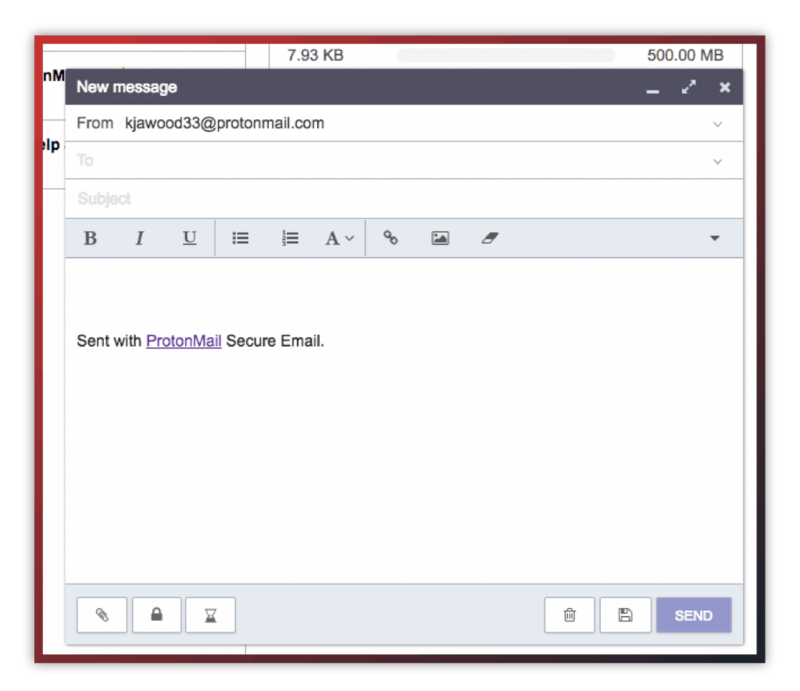 If you’re serious about sending anonymous emails and also want your email communication to remain encrypted, then your best option is using a service like ProtonMail, MailFence, or Tutanota. Services like these allow you to send and track your anonymous emails, send encrypted and password protected emails, create account aliases, and even have your emails deleted after a set period of time. The method you choose for managing and sending anonymous emails depends upon your needs and privacy concerns. 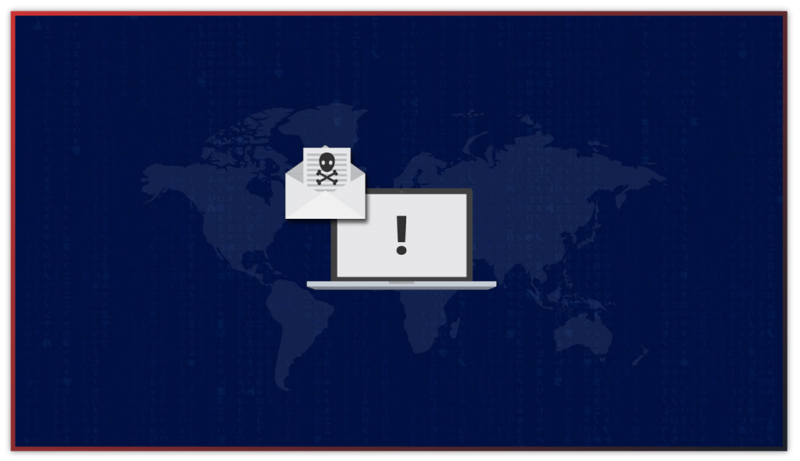 Hopefully, you’re better equipped to navigate the world of anonymous email and can protect your privacy and personal information from falling into the wrong hands. Have any questions about which anonymous email service is best for your needs? Please share your questions and concerns in the comments below. Hello: a friend recently had need to send an anonymous email to let a coworker know they were being cheated on. However, things got picked up by HR and there is an attempt to find the sender. A protonmail account over Tor was used. The account was deleted after it was clear the message was received. Is there any harm the email can be traced? 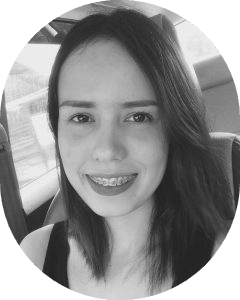 I have read so many conflicting accounts, some saying that emails can’t easily be traced – especially without LE help, while others warn that it is very simple to do. Without LE help it is doubtful you will be found out and LE does not have jurisdiction in cheating spouses unless another crime was perpetrated. If LE is involved ProtonMail is not secure. You are completely out of date. Even sites that claim they provide anonymous email accounts. They figure out one way or another to get your real email address, your real telephone number, your credit card number and/or offer a trial and then when you try it out, they collect your IP address and stamp your email saying that it came name their socalled anonymous site as the site where you send your email. There is no anonymity anymore. In other words, your tutorial is misleading and wrong. Hi, I have a few questions, I’m new to all this and computer illiterate so please forgive me if I ask the flipping obvious! 1) I am only interested in the most secure e-mail providers who give you the option of keeping all your mail permanently in a format you can access. Of the above which providers offer this please? 2) which ones will allow you to have more than one e-mail account? Even if you have to pay for a second? 3) If you choose to pay for a private e-mail service, can you not be traced through the payment? 4) I’ve read many times that gmail dose not always delete their copy of your e-mail when you delete it. Is there a deeper delete you can do in gmail? Also while we’re on this subject, of the above, are there any whispers of any of these providers doing this? 5) If you import your old e-mails from say gmail, then can you not be traced back to your true identity through this? 6) If your device itself can be traced, i.e. through the purchase, it’s covered on a care plan you pay for monthly, or it’s a phone and you have a contract, then can you be traced? Or dose hidding the IP address completely resolve that? 7) If you want to start a fresh with a device you’ve used in the past, is factory reset a deep enough wipe? Or can data still be recovered? 8) What is ‘No One’ refuring to? They sound like pitfalls, set up to gain your identity. Can you explain please? and what is LE? and why is ProtonMail not secure if it’s involved?